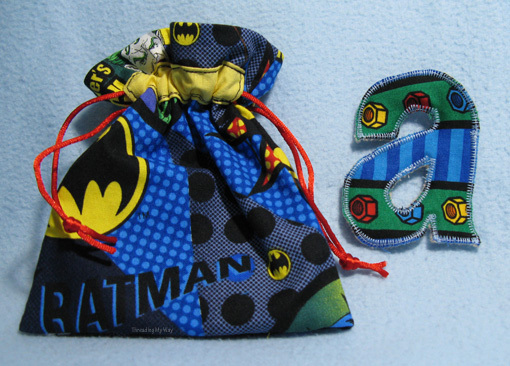 We have a little member of the family who is obsessed with Batman, so I thought I'd indulge him and make some Batman themed presents. 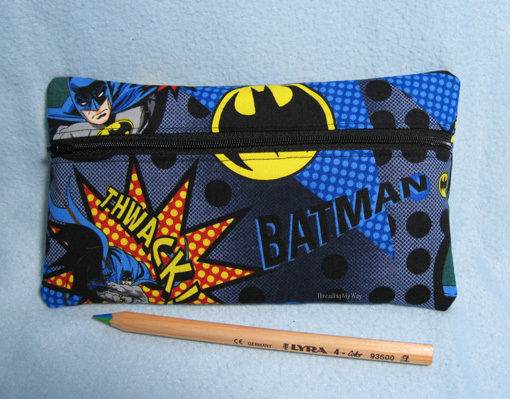 As I was really pleased with the first pencil cases I made a couple of months ago, I've used the same pattern again this time... the Front Zip Pouch, by Sew Mama Sew. I had a couple of minor hiccups (that were easily rectified) with the first pencil cases, but this time, it all came together easily and quickly. Well, that is if you don't count the missing strap. 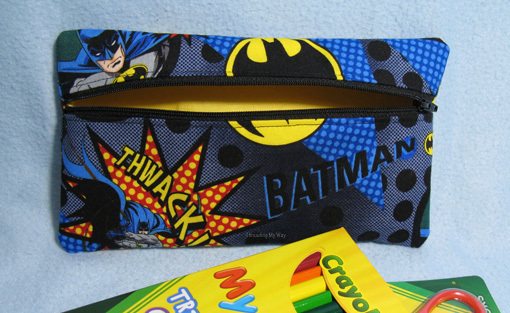 It's there; it's just sewn inside the pencil case... LOL!!! I didn't realise until everything was sewn and turned. I figure no one will ever know it was meant to have a strap, unless they feel the extra thickness where the strap is. From now on, I think I'll sew future pencil cases without a strap and that will speed the process up even more. I made two drawstring bags, with the second containing some handmade, knitted finger puppets I bought from a seller on Facebook some time ago. 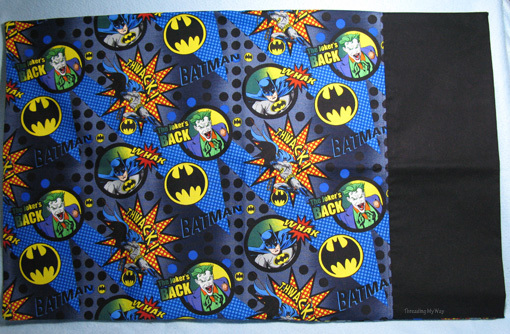 And lastly, a Batman pillowcase. As I often make pillowcases, I have pattern pieces cut out with measurements from the pillowcase tutorial by Flower Press. I find using pattern pieces easier than measuring and squaring fabric each time. Earlier this year, I made the little recipient a Batman mask and it went down well. Let's hope he's just as impressed with these Batman themed presents. Awwwwwwwwwww I'm all about the theme - I love working on themed gift sets! 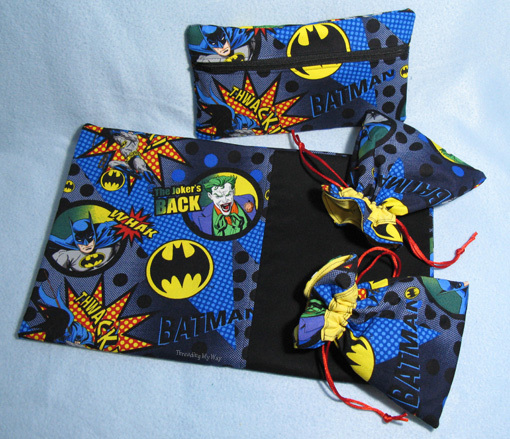 Batboy is going to be pretty excited when he sees his Batty collection of goodies! Had to laugh at your mishap with the zipper Pam! The Bat fan will be thrilled with all of your great makes I am sure. I'm cracking up! I was singing the theme sing in my head when I read the title, then my thoughts turned into your opening sentence! Great bag! Did I ever show u my hubby as batman? I'll try to find it for g+! Huge Batman lover. I want the car. How could he not be impressed with those gifts Pam! What a lucky boy!! That fabric is so cool! I love the fabric and each item you have created. Nice job Pam !!!! they are just fab Pam, great gift for a little boy. The fabric letters must have taken forever though! These are so fun! Thanks for sharing! Visiting from "i should be mopping" link party! Great items! These would all be good for Operation Christmas Child shoe box gifts--that's what I'm on the hunt for. What a cool gift! Any boy would love it! How cute. I love gifts that coordinate. Thanks for linking up to the Ducks 'n a Row blog hop.